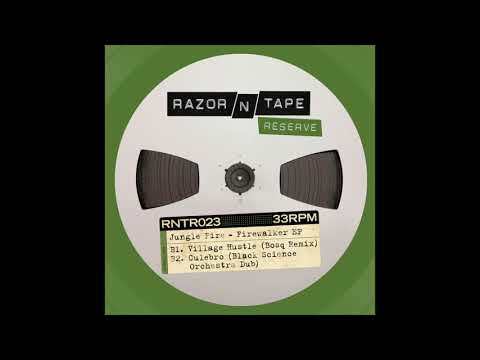 Razor-N-Tape bring out the big guns for their remix package of the Los Angeles Afro-Latino funk band Jungle Fire. JKriv’s remix of ‘Firewalker’ channels the original live instrumentation into a bombastic, DJ-friendly workout, while Boston-born/Medellin-based producer Bosq steps up to tackle ‘Village Hustle’ bringing his unique blend of rhythmic flavours to this melting pot of zesty goodness. This diverse 12” also boasts the first remix and release by the newly-reunited Black Science Orchestra in 15 years! Original founding members Ashley Beedle and Rob Mello take on ‘Culebro’ and transform it into a pulsating Afrobeat groover. Bringing the infectious bass to the foreground behind a shuffling rhythm layered with guitar and horn samples, BSO turn out a serious heater of a remix and dub, worthy of their triumphant return! Pre-order already available!